5:20am: Wake up. Gah. Gaaah. 5:40am: Arrive at the shop, begin packing bags and filling in the boat list. 11:20am: Back at the shop, wash gear and fill in log books. 11:30am – 11:45am: lunch break! 6:30pm: Finish up, go home, have dinner and do my utmost not to end up naked and dead on the beach. Life on Koh Tao has been mostly interesting. A fat Burmese woman threatened to have me followed and beaten after I reported a theft, I learned to ride a semi-manual bike and rode it to the top of a mountain without injury, I got attacked by triggerfish twice, I made and lost a dozen close friends and picked up crochet and the ukelele. A divemaster on Koh Tao can earn somewhere between 12k and 30k baht per month ($350/£225 – $890/£560), which is more than enough to sustain you (and enough to save if you are thrifty). Bringing customers to the dive school earned you a commission of 10%. 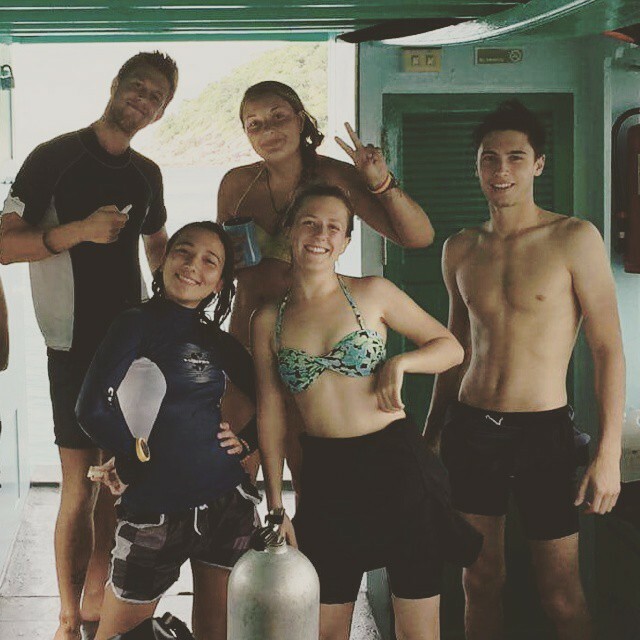 I convinced 5 people to dive with my school and earned 5,400 baht. Someone quit their DM course without finishing, and I obtained their crew pack for 1,000 baht. Buy secondhand! Unless you’re a professional, in which case you should really buy new.. which I will do when I have some money. Shared bathroom, cold shower, manual toilet, no wifi, no overnight guests, and a room measuring just 3x4m. Ticks all of the boxes. I ate rice and bananas a lot, and I rarely ate western food. a budget of 60 baht per day is doable (especially when the street vendors start recognising you and give you extra portions). Food costs a lot more on the island as everything has to be brought in daily by ferry. A meal costs between 30 and 80 baht for Thai food, and 120 – 800 baht for western food. I don’t drink, I rarely went out and there is nothing to do on Koh Tao except drink and party. Hiking is free, swimming and snorkelling are all free! Motorcycle rental from a friend: 1,500 baht per month. Petrol adds another 350 baht per month. My course took me 3 months to complete. Some people do it in 2, but the longer it takes the better prepared you’ll be. To actually find a job, you need to be proactive. Put CVs out to all of the dive shops (and put ‘updated’ ones in every few weeks) and hang around often enough that they recognise you. They will keep calling you back if you are cheerful and professional. Life on Koh Tao has its downsides though. Tourists are disrespectful toward Thai Culture, most foreigners working here know virtually no Thai, and you really start to notice the lack of interesting things to do after several months here. In Australia, you can train for free in exchange for a month’s work. This might be a better option for some people. – The PADI Divemaster course is more rigorous and allows you to do more once qualified (Scuba Reviews / Scuba Tune-ups / Discover Scuba Diving Leadership / certifying skin divers). SSI DM course fees are higher too (35,000 baht). – Don’t adopt a dog. Do not trick a living and loyal creature into relying on you when you will abandon it after 5 months. – Enjoy being able to do whatever you want (like skip the morning dives due to a hangover), because it won’t last. As soon as you start working, you need to be where you’ve promised to be. It’s perfectly possible to vomit through a regulator; tell your customers it’s food poisoning if you want to maintain that veneer of professionalism. I personally have- hand on heart– never dived with a hangover.. because I’ve never had a hangover.. because I don’t drink… which is how I manage to keep my food budget so low. Hi Lana – I like that your posts are blunt and honest, not only depicting the awesomeness of travels. Enjoy and keep us posted. Thank you! I think when you settle in a place and start working (and then can’t just arbitrarily give yourself a day to do nothing) the glossiness starts wearing off and you see all the not-so-great parts. it sounds like you might be a badass. keep living the dream, even as it morphs into new locals. Teehee, thank you! I certainly don’t feel like a badass each time a cockroach runs over my feet while showering.. but there are no witnesses so hopefully I can keep up the pretense. This post was a ride from start to finish and i’m thinking that learning how to crochet while becoming a Divemaster should go somewhere on your CV, definitely. Also, while i’m not much for drink either, I think I know a few people who will relish in the fact that it IS possible to chunk through a regulator, and while I hope none of them will ever dive while hungover, it’s a useful bit of information to pass along. I got very distracted by things and let blogging fall to the wayside. So much to catch up on, and so much to see on yours too! Eek, congratulations on the house!! To add to the vomit thing: if you’re anywhere near the reef, a swarm of fish will come along and gobble it all up. Certainly makes for an interesting few minutes. I must be wonderful to be young and have all those exciting adventures! I am living vicariously through them. Thanks! You will have wonderful material to use books later. Keep living your dream. Thank you! Glad to hear you’re enjoying it! This is really interesting, thank you! It’s so refreshing to read an actual breakdown of someone’s budget, I totally get why people are shy about posting money stuff but it’s great to see how these things actually work. Diving has been a dream of mine since I was a child, one day I’ll do it I’m sure! I know! Travellers on the road are quite honest I’ve found when it comes to money (and actually, I frequently get asked by colleagues how much I spend on rent without any shame). 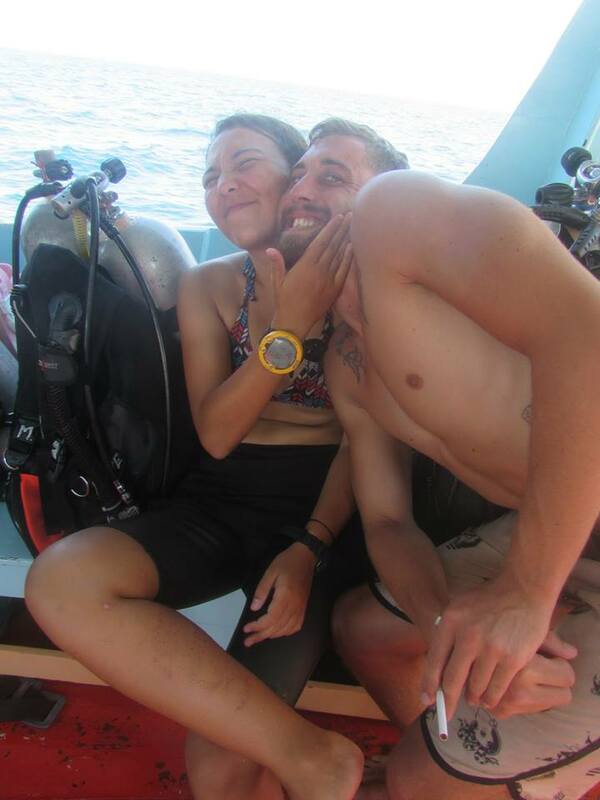 If you decide to come and dive on Koh Tao, drop me a message and I’ll take you around! Thanks, I will! 🙂 And if you’re ever in London, feel free to do the same! Nice post! That’s a great breakdown. I would love to dive one day. That 5:20 am wake up call would be difficult for me though. Not all dive schools start the day so early- some go out as late as 7:30am.. just ask them before signing up, hah. 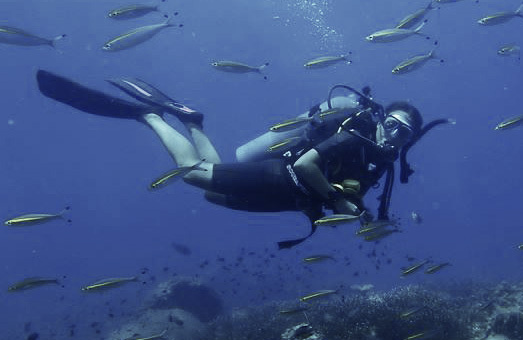 Diving is great fun- you should definitely give it a go one day! After weeks of stalking your blog, you’ve finally updated it with posts of koh Tao – you definitely have to update more so I can live vicariously through you. Missing you and the Asia divers guys! Hey, cat lady! Yes I have. I also have a ton of other posts from Laos still to publish..
Also, it’s linked! I don’t drink, therefore have zero tolerance, so then on the extremely rare and blue moon occasions that I do, I don’t react well, which discourages me from further drinking. I only can say: you’re amazing Lana! Keep up the good work! Thanks for sharing your experience as a dive master man! Awesome post. I’ve thought many times of doing a dive master internship like this. You mentioned being able to get free dive master training in Australia in exchange for a month of work, do you have any more details on that? I haven’t got any details, but you could try contacting schools/liveaboards directly and asking? I know quite a few people who have done this (and gone all the way to instructor actually) so it definitely exists! Good luck!